My apologies to readers who have noticed that there has been a considerable delay in posting the next in my series of commentaries on “art in general”. The delay has occurred partly as a result of some upgrades needed for handling large numbers of comments (a “Site Use” page has been added to the website), but also due to difficulties in trying to deal with copyright issues. I will post this short commentary to explain, and then the usual posting which should have appeared much earlier, will be posted, but not as originally planned. I will try to explain the situation here. Before I begin this latest explanatory post, I want to take a few moments to acknowledge and thank all of you who have managed to find my new and relatively unknown blog. Launched without great fanfare or even much planning and no advertising, many of you have found your way here and have taken the time to post encouraging words and comments which are greatly appreciated, and I thank you for your efforts and the kind words of encouragement. In some cases, however, posted comments contained clearly commercial links unrelated to this blog or its content. In an effort to help to preserve the original intent of this blog, and to prevent it from becoming a distraction for unrelated purposes, whether intended or not, I have added a page “Site Use” in which I ask that comments be relevant to the content and purpose of this blog, and that, unless a link clearly supports a relevant comment by a reader, links to other unrelated websites will not be approved for posting. Due to the use of new comment management software, most of the original posts do not appear any longer, and my apologies to those of you who may have been wrongly affected by this recent change. I certainly do not mean to discourage any legitimate comments or use of the website, and encourage you to please keep in touch and let us know what you are thinking (sans unrelated commercial links!). I apologize again for the delay while updating the management software for this blog, but I hope the result will be worth it for all concerned, and I say that with all sincerity. I further apologize for the delay in the usual business of posting new commentaries on this blog by me. A second issue came up soon after the blog was launched, and it is one which all bloggers must eventually deal with, I suppose. It is important to me to be able to post images, and perhaps other related material to illustrate points which I wish to make, in the process of my ongoing conversations about the subject of art and artists. The next post which was intended to appear in this sequence was to be about an artist whom I mentioned in the previous posting, and whose work I felt would be of interest to my readers. I will certainly post the commentary which I have prepared, but I delayed posting the note until I could obtain further information on copyright issues related to posting examples of the artist’s work. I feel that they would be an important part of my commentary, and it’s always most convenient to readers if images being referenced can be seen as part of the posting. Unfortunately, I am not a lawyer, and my research into copyright law has led me to believe that this area of law is confusing, to say the least. I have found many sites which address this type of issue, but I have found few definitive answers. Perhaps the best that I have found simply advises, “when in doubt, don’t do it”, and I suppose that can be taken as perhaps a general principle that might apply to just about anything at all, but it might be a good principle to have in mind. I did invest time in trying to obtain permissions to use material from other websites (art museums, etc) who do display images related to my post. I hoped that I could just obtain permission to post selected images on my website as examples, with credit to the sources. To date, I have received no responses from anyone from whom permission was requested. That is not to say that I might not eventually obtain permission, but the wait could be long, indeed. After failing to make much headway with copyright issues, I have been advised to simply provide links to sites where material can be found, including images, related to whatever I would like to talk about. In the interest of avoiding further delays in posting, I have decided to go ahead with my own comments and images (no copyright infringement there), and simply provide links in the text to related material which I think would be of interest to my readers. I hope you will understand that this is a compromise choice, but it is one which I think will work, even if it is not my first choice. I don’t have a staff or budget to pursue permissions for everything, even if they could be obtained, so hopefully this will answer the need to help you find supplementary material which is related to my postings. Enough said about that, and I assure you that when permissions can be obtained, I will provide the material, especially images, within the blog itself, and I will welcome comments from anyone who can shed further light on this issue. In the meantime, for the sake of your further amusement (if not enlightenment), I’ll just post a quick, colored sketch of my own. 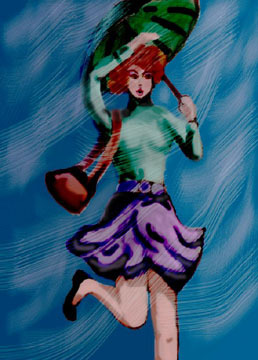 I think of her as a New York girl running to catch a taxi in the wind and rain (in keeping with my current theme). Sometimes I feel just like this – how about you? Isn’t life just like that? My thanks again to my loyal new readers for your interest and your comments. My next regular post will appear shortly (as soon as I have installed the requisite links to supplementary material of interest). Until then, my apologies to anyone who might have been affected by changes in the website and to delays in posting. I’ll hope to see you again soon, and in the meantime, let’s try to make the most of the stormy days of life. Your taxi cab to safety is probably just around the corner! Wishing you a great holiday weekend!